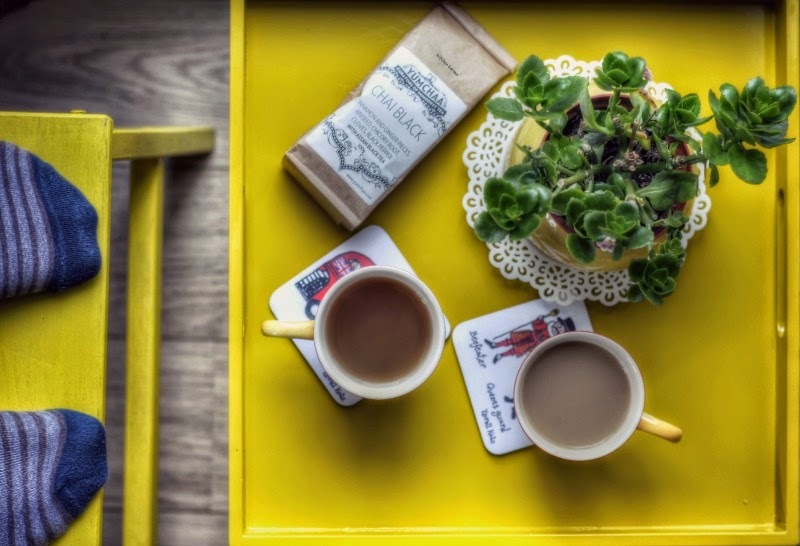 Thanks to Yumchaa loose leaf tea is back in fashion in London! And nothing gives me more pleasure than a pot of fresh, aromatic tea made with loose leaf! Call me old fashioned, but I have grown up drinking loose leaf teas and I think they are way better than the bagged ones. Of course I am hugely influenced about this by my father who has worked in the Indian tea industry for about thirty years. He mostly worked in Assam and Darjeeling and I remember those silver foil wrapped tea packages he bought home every time he returned home to Kolkata from the tea gardens. Back to London and Yumchaa, husband is a huge fan of their Chai Black. This blend is basically Assam Black tea with Indian spices thrown into the mix like cinnamon, cloves, black pepper, aniseed, ginger. The tea is pretty strong and spicy and has a warming effect. It's perfect for cold/rainy days when your body craves warm drinks. And it's absolutely heavenly and soothing when you have got a cold. In fact when I was a kid my mom would make such an infusion for us if we had a cold. It used to make us feel all grown up since tea was a very occasional treat and a medical remedy to beat the cold. Yumchaa's Chai Black reminds me of that days and those special cups of tea. My husband drinks it the Indian traditional way with a dash of milk and a hint of sweetness. I like it without milk and sugar. This cup I made with a drop of milk and realised I am good without. Of course if you plan to have this tea without either milk or sugar, steep it no more than a couple of minutes, otherwise it will become too strong. For my husband I steep it for about 5 minutes. If you like spicy, strong tea, but don't want to get into the hassle of making the mix yourself, Yumchaa's Chai Black is perfect for you.